And it is all at a reasonable price. You get 20 levels of magnetic resistance to provide the ability to set the workout intensity you want. Plus a console that comes with 22 Workout programs for plenty of choice and motivation, as well as speakers, fan, USB charging point and water bottle holder. There is a belt drive and weighted flywheel to provide a good steady pedaling motion without choppiness. So there are plenty of features for a good low impact cardio workout. In this review I take a look at all those as well as how well it performs in giving that workout in your home and who it is best for and who might be better looking elsewhere as this upright exercise bike as good as it seems isn’t for everyone. First thing to look at is whether it is steady it is as you workout. The bike has a steel frame and oversize stabilizer bars that keep the bike steady and there is no flexing no matter how hard you’re working out. However, it is really designed for exercising in the seat and not standing on the pedals. There aren’t any creaks or squeaks to distract you either. If the bike does rock at all there are levelers in the back stabilizer bar end caps that are turned to level up the bike to stop this happening as a result of an uneven floor. The warranty for the bike is 10 years for the frame, mechanical 2 years, electrical is 1 year and labor is 90 days. It is a good length especially for the frame. For most it seems that the bike provides a good durable solution when being used for moderate levels of exercise (i.e. not standing on the pedals). The seat height can be adjusted to fit a range of heights. You can change the height of the seat but not it’s horizontal position – nor can you change the position of handlebars but you can change its angle. Schwinn have indicated that the bike is best for people between the heights of 5ft and 6 ft on average. Customer experience backs this up, from their reviews they say it is good for those between 5ft and 6 ft 1 ins (although some who are 4 ft 10 ins have said they can use the bike comfortably). Above the max height you can still use the bike but you probably won’t get full extension of the leg as you pedal (which is best for comfort and preventing injury) and depending on how tall you are may find you are banging your knees on the handlebars. The adjustment is quick to do involving just one adjustment knob and sliding the seat to the height you want and then tightening it up properly after to stop the seat slipping or shaking. It does mean it can be used by multiple users to get their exercise as it doesn’t get in the way of getting on getting started. To help it setting it to the right height you can use a permanent marker pen to note your setting. Most people don’t have an issue with the seat positioning but if you are shorter you may find that you are having to lean forward or stretch more making it uncomfortable, as you can’t move the seat back/forwards to make allowance for differing upper body lengths. The 20 levels of resistance is adjusted and displayed through the console. You can adjust it 1 level at a time or jump to one of 10 levels (see console section for levels you can jump to). The transition between the levels whether moving to next one or making a big jump is smooth – it does suddenly go from one level to the next it gradually gets easier or harder. The resistance goes from very easy to hard to cater for a wide range of people. The lowest levels are very easy and should be okay for those who want very little to get started with. It shouldn’t be too much of a challenge for anyone. The top range should challenge all except elite athletes. For the majority they can find the level they want and pedal at the intensity they want. The pre-set profile programs adjust the resistance automatically as you work through the progam. With the pre-set profile programs if the resistance isn’t what you want whether too hard or too easy you can set it to the level you want using the up/down buttons on the console. The magnetic resistance is provided by a set of magnets that are close to the flywheel – when increasing resistance these move closer to the flywheel and vice versa to decrease. It has a belt drive and a 13 lbs weighted flywheel to provide a smoother pedaling experience. It helps to keep it smooth at all levels of resistance although at top end resistance you may notice it starting to pulse slightly as the resistance starts to work as brake on the flywheel – you need to concentrate more on your pedaling form to overcome this to stop it becoming a more up and down motion rather than the circular motion it should be. These are all inside the shroud that helps to keep them protected from dust and sweat. It also stops children and pets and yourself being injured by the moving parts. The standard size pedals with straps are attached to a 1 piece crank which should give the strength for a good solid pedaling motion when used as designed. The bike is designed for sitting and pedaling, not for standing on the pedals as you would with a spin bike (see best spin bikes under $500 if that is what you after). Some people do it but it is awkward and is likely to shorten the life of the bike if done for prolonged periods. The straps and grip on the pedals will help to keep your feet from slipping off them. They have plastic straps with holes that you put over a tab on the pedal to adjust. They’re not the easiest design but once in place you can just slip your feet in to them. The pedals work best with athletic shoes or similar. If you have feet that are over size 10 you may find that you bang your ankles or heels on the crank arm (not all people with over size 10 feet have this issue but some do report this). People who have this issue have taken off the strap and moved their foot out a little on the pedal or contacted Schwinn direct and bought wider pedals when they explain the problem (you may or may not get them for free!) from them or gone for pedal extenders. The alternative is to look at the Schwinn 170 that doesn’t have this issue, but it does cost more. You won’t be able to replace with regular bike pedals (1/2 inch) as they don’t use the standard bike thread you are best checking at a bike shop if you do want to change the pedals. It is possible to pedal backwards but there is no resistance to push against. Seat. The seat is padded and isn’t contoured. It can provide enough comfort for some people so they can use it for as long as they want. But like all bike seats it is not going to meet the needs of everyone. If you haven’t been on a bike for some time it is likely you won’t like the seat at first. It takes time to get used to any seat – after a few weeks you may find you have got used to it. But even after that time you still might not get the comfort you need to use the bike as long as you want to use it. Some find it extremely painful and suffer too much numbness. To help if you don’t like the level of comfort offered by the seat you can try either padded bike shorts or a gel seat cover which for many is all that is needed. If none of that works and the bike still is too hard you can replace it with a more comfortable bike seat that fits a standard bike. Handlebars. The angle of the handlebars can be changed to help you get the best position. You do this by turning the knob at the center and moving the handlebars to the angle you want. The ends of the handlebars are turned up so the more you move the handlebars the harder these become to grip unless you lean on the rest of the handlebars. It doesn’t come with elbow pads so if you do lean heavily on the bars you are likely to end up with sore or aching arms if you do it for a time. The handlebars are covered but not padded – this helps with keeping a comfortable grip and you hands not slipping when they get sweaty. Noise. It operates very quietly. You can use it while the TV is on and not have to turn it up. You can also use it while others are sleeping, including children, and not disturb them. This allows you to use it when it fits in with your schedule – whether you work nightshift or have to fit it in around a busy life and children and so on. It is more than quiet enough to use if you have an apartment. Your neighbors won’t know you are exercising. If you live on an upper floor and are concerned that they may hear something through the floor putting it on a rubber exercise mat should stop any slight sound being transmitted through the floor. Cleaning Up. There is not a huge amount of cleaning needed due to using the bike. The biggest source of cleaning is not from the bike itself but from the people using it. Depending on who is using and how hard they are working it is likely they will sweat and this will drop on the bike and floor. It’s important it is wiped up from the bike to stop it corroding it (sweat is very corrosive). If you want to protect your floor this can be done by putting the bike on a rubber exercise mat. When not in use the bike needs an area of 21.4 by 41.3 ins so will fit well in a corner or if you have a large closet it might just fit in there, if you can’t leave it out. It won’t over power a room like larger bikes can do so people do leave it out even when it is in their living room. It helps to serve as a reminder that it needs to be used! If you do want to move it there are 2 rollers at the front of the bike that you tip the bike on to. They hold most of the 58.4 lbs weight of the bike leaving you to wheel it where you want it to go. The wheels work best on hard surfaces, on soft carpet it is likely you’ll find they stick a little resulting in you having to slide the bike. On a wood floor these wheels can sometimes scratch or even dent so it is a good idea to test them out before you leave a long scratch or dent in your floor. The bike is delivered part assembled. The most difficult part has been done. Most can complete the job in 1 to 2 hours with some doing it much quicker. It is also fairly straightforward – it is easier than putting together kitset furniture. The instructions and diagrams do a reasonable job of describing the process. The tools needed to do it are included but you may want to use your own if you have them – it will make it quicker. You are required to add the pedals, seat post, seat, front post, handlebars, console, upper shroud and bottle holder to the frame and drive assembly. If you want you can have it assembled for you in your home through Amazon but you do have to pay extra for this. I don’t think it’s necessary but if you still feel unsure it does provide peace of mind and saves you some time too. The console has most of the extras and those not related to measures and programs I discuss under the accessories section below that is – fan, speakers, charger and media shelf. At the top of the console are USB charger and audio jack. First up on the console are the dual displays with the main display measuring 5 by 3 ins and secondary display being 5 by 1 ins. When you use the media shelf for a tablet or similar device it covers the main display but can still see the measures in the lower display (secondary display). The displays do show different information and in different ways. Starting with the main or upper display. This has at the left side a column that goes from 1 to 10 which lights up to the level of work based on the resistance you are currently using – I’m not sure why they use 1 to 10 when there are 20 levels of resistance! On the right side is a similar column that shows current heart rate zone – indicating if you are at 50% or below, 50 – 70%, 70 – 90% and 100% of your target heart rate. At the top it lets you know what program you are using. Below this in the center is where you are givien a graphical display of the program. It is split into a series of columns with each column being a time segment of the workout and the height of the column letting you know how hard the resistance. The flashing column lets you know where you are up to. It is a simple but effective way to let you know how you are getting on. Below this is a section that lets you know what target you’ve set yourself (calories, time or distance)., hoe much you’ve got left do in numbers and percentage completed of target. Next to this is an indicator to show you the user profile being used and also if a goal has been achieved – this lights up when one has happened and makes a sound – which as quaint as it may seem can give you a bit of a boost to keep you going. Next is the media tray for putting personal electronic devices. Underneath the second display at the sides of the console are 10 quick jump buttons to jump quickly to resistance levels rather than having to push the up/down buttons and having to push through all the levels to get there. The levels you can jump to are 1, 3, 5, 7, 9, 12, 14, 16, 18, 20. The transition to the new level is still smooth it just saves you having to keep pushing a button to get there. In the middle are the buttons that are used to select and control the programs and setting up the console user profiles – quick start, pause/end, programs, goal tracking and 4 direction arrows and okay button for moving around menus and selecting values. Below these buttons are the speakers at the sides and in the center is the fan and button for controlling the fan. 1 Quick Start. To access this you push the quick start button on the console after choosing the user profile. Then you can get started and adjust resistance for as long as you want. 9 Profile Programs. These programs are where resistance is adjusted by the bike as you move through it. The programs are split evenly through three categories – fun rides, mountains, challenges. You can set a distance, time or calorie target for the program you select, You can change the resistance if you find it too hard or easy. You pedal at the speed you want without any prompting from the console. There is good choice for all abilities and to help you with your fitness goal. Fitness Test. This is a test of your fitness to see how you are progressing. You choose between beginner and advanced. You need to hold on to the hand pulse sensors – after a warm up period you have 3 minutes of constant resistance and at the end of that you are given a score where the higher the score the better your fitness. Heart Rate Control Programs. There are 4 of these programs – 50 – 60%, 60 – 70 %, 70 – 80% and 80 – 90% which are based on your target heart rate (based on age). You can select whether you are beginner or advanced. The resistance is changed up or down automatically to keep your heart rate in the zone selected. You have to be gripping the hand pulse sensoors for this to work. You can set up 2 user profiles that help you get better measures and results for each person. It also helps in tracking them too when you upload to the Schwinn Connect Fitness account. You can enter a name, gender, weight, height and age to help with calculating calories used and heart rate zones. If someone who isn’t set up in the profiles uses the bike their workout will use the last person to use the bike’s profile to calculate the measures and add the result to their records. If you’re uploading online to keep a record and analyze you need to be aware of this keep your records up to date. To use the heart rate control programs or to see your heart rate you have to be gripping both hand pulse sensors on the crossbar of the handlebars. To get any chance of a good reading you can’t move your hands so it does restrict where you can place your hands. Some people will find they can’t get a good reliable reading from the sensor, and that is usual for these type of sensors no matter what bike they are on. It’s just the way they are. If getting a reading of your heart rate is important you are better going with a heart rate strap, which isn’t compatible with this bike so you won’t be able to use the heart rate programs. The more featured bike that is very similar to this bike the Schwinn 170 does work with non-coded Polar heart rate straps is a better option but it does cost about $80 more depending on current deals. Calories burned is an estimate only and can be used more for comparison between workouts than actually used for determining deficits for the day. It gives an indication only. The manual included with the bike don’t have full instructions on how to use the programs, you have to go online to get all the details needed to use it fully. To turn on the console you either plug it in, push any button on the console or you start pedaling. It will turn off after 5 minutes of inactivity. If you unplug the bike your workout and profile information is stored by the machine available for when you use it next. The console does beep when you use the buttons and when goals are achieved as default but this can be turned off it annoys you or it might disturb others using the set up mode. The screens aren’t backlit so it can be difficult to read when light isn’t the best. USB Charger. You can plug your electronic devices into this using a USB cable and it will charge them. It is a slow charge, so if you are using a the device like a tablet or similar it won’t charge them up but will prevent them from running down. You do need to supply the cable yourself. Water Bottle Holder. The plastic holder is on the front support post. It should fit any size drink bottle as it is a large holder. You do need to lean forward and slide bottle out of it to use and slide it back in after use. You may find you have to slow your pedaling while you do this. Speakers. The speakers don’t go that loud and if you want louder music or better quality you may need your own speakers (separately) or use headphones. You plug your device into the console using the supplied media cable. The volume and program selection is done using your device. Fan. The fan is operated by pressing the button on the console. The wind comes out from the center of the console. It is more of a cooling gentle breeze than a wind even at the top level. Fitness Account. There is a fitness account you can upload the results of your workout to the Schwinn Connect account that you can then sync with myditnesspal.com to keep a track of your exercise. You need to use a USB stick to do this. It doesn’t have bluetooth capability. For me this is where you can get the most information and tracking of goal achievement – probably more so than the goal tracking on the console itself. You can use the myfitnesspal.com to share with friends and others if you want – you don’t have to that is your choice but having others give you encouragement can be great and depending on who you are you can compete with them and also “wind” each other up. If you want to watch TV you probably need to set the bike at an angle to it so that the TV isn’t blocked by the console. Customers on the whole like the bike with 75% rating it a 4 or 5. But the bike does come with a few problems for some customers. There are issues with shipping for some, although that now seems to be less of a problem now, with the bike coming as if it has been dropped a few times on the way. The company can also be a little slow in responding when there has been an issue. As expected there are a number of people who find the seat very painful to sit on – this is often a personal thing but this bike does seem to be particularly bad in this respect but it can be fixed with a gel seat cover or by replacing the seat. If you have size 10 feet or over you may find you are banging your heel or ankle on the crank each time your feet go round. Some people have been able to get pedals from Schwinn that have sorted the issue at no cost – but not all – some have had to pay extra. Others removed the straps and that sorted the issue. If you have larger feet it may be worth paying extra for the Schwinn 170 that doesn’t have this issue. It also has an horizontal and vertical adjustable seat, customers on the whole find the seat more comfortable and it comes with more workout programs and user profiles. The majority do say the Schwinn 130 is good value for the money and is sturdy and last for a good length of time. They like that it is quiet so can use it when they like it. The console provides a good range of programs to keep them interested and challenged. You do have to pay more for the bike than a basic upright exercise bike but you do get a lot more features than those and you also get a lot more features than you get with a spin bike (although you can stand on the pedals on those bikes). When I checked Amazon it qualified for Prime and free shipping on eligible orders. 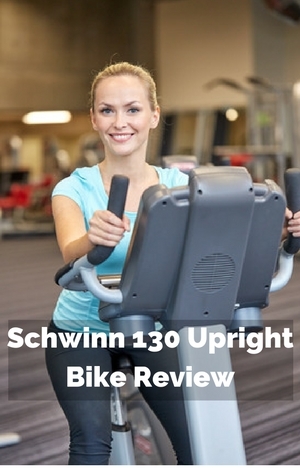 The Schwinn 130 Upright Exercise Bike is good for beginners and those who want a quiet low maintenance bike that has a good level of variety – and suiting those who want medium levels of training. It doesn’t take up too much room, its quiet, easy to assemble and can be moved easily when you want. This bike isn’t for people who want to be spinning or doing hill climb workouts as it isn’t for being used while standing on the pedals for long periods or very intense workouts or wanting to put in serious training for a major event like a triathlon. It’s great for those getting started, get in shape or those looking to burn calories to help with weight loss and wanting good solid low impact cardio workouts.